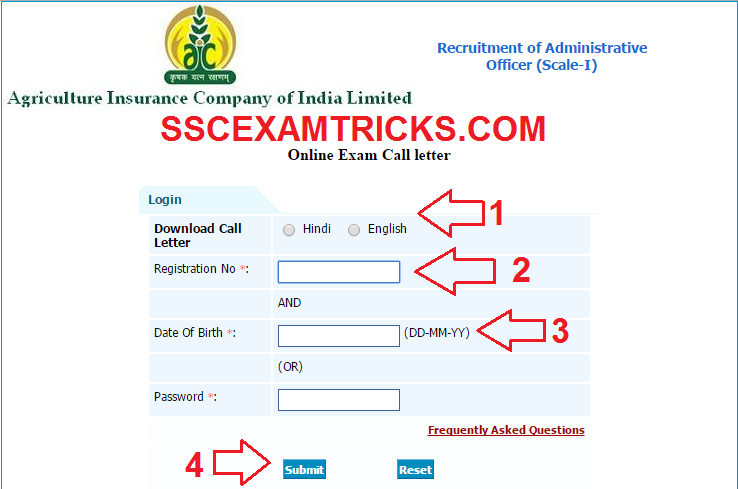 Agriculture Insurance Company Limited has released admit cards/call letters/hall tickets for written examination which is going to be conducted on 22nd February 2015 for 38 posts of Administrative Officers Scale I in specialized discipline of Agriculture, Information Technology, Finance, Legal, Statistics and Generalist at the various centres in all over India. The exam date is mentioned in the admit card of candidates. 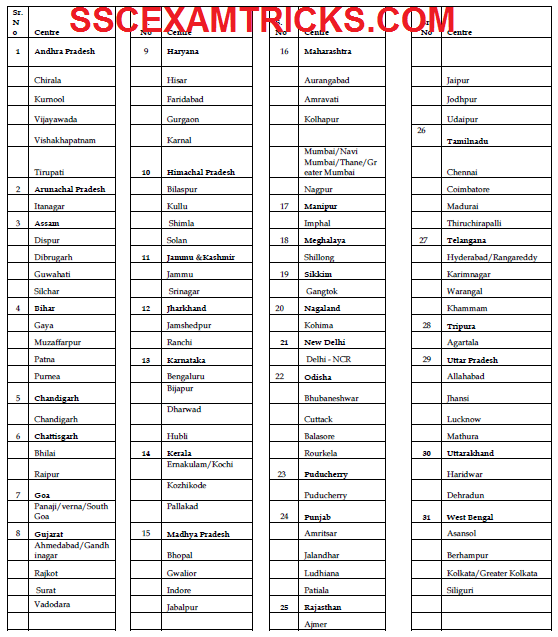 A lot of numbers of candidates had applied for exam. The Latest News for those candidates who had applied for AIC AO Exam 2015 and waiting for Admit Cards Call Letters can get their Admit Cards Call Letters from the direct link provided in the end of post. · Choose your language to download Admit Card. · Enter Registration ID of the candidate. · Enter Date of Birth of the candidates. The AIC AO Exam will be conducted in the month of February 2015. The AIC AO EXAM 2015 will be conducted by Online MODE. The written Examination will be conducted in two parts. The written exam will be provided in bilingual language i.e. Hindi and English. Part I - Objective Written Exam for AIC AO Scale I – This Exam will be qualifying nature & marks will be counted to prepare Final Merit List of the short listed Candidates. In ONLINE Mode, No OMR sheet will be filled by Blue/Black ball point pen. Answer will be chosen on the computer through clicking left click of mouse. The candidate will be banned to use keyboard in the exam. All the information/ answer will be provided online by mouse click. The Computer will be reserved for all the applied candidates and will be kept reserved even absent of candidates. AIC AO Exam will be an objective /multiple choice question paper consist of various sections i.e. Reasoning (50 questions of 50 marks), English Language (50 questions of 50 marks), General Awareness (50 questions of 50 marks) and Quantitative Aptitude (50 questions of 50 marks). The exam will be a multiple choice question paper containing 200 questions of 200 marks in which five options will be provided out of which candidates need to choose one correct answer. The time duration of exam will be of 2 hours or 120 minutes. There will a negative marking of 1/4th allotted to each wrong answer. The Descriptive Exam will be conducted 10 minute after completion of Objective written Exam. The Descriptive Exam will be of 30 minutes containing 3 questions only. The Descriptive Exam will be conducted ONLINE. The questions will be provided on the computer and answer sheet will be provided manually to each candidates. The answer will be provided by writing answer on answer sheet by Hand. The descriptive test may consist of writing essay, letter, precis etc. Best Books / Best Exam Material i.e. Quantitative Aptitude by R. S. Aggrawal are mandatory requirement to qualify such tough exams in a very short duration of time. Here, Best books are recommended to the candidates who are genuine and willing to qualify the written examination with in a preparation of 2-3 months. ENGLISH Tricks by Paramount , SSC Tier 1 ENGLISH by Arihant Special Addition exam oriented & Office Assistant Practice Book by Kiran books will definitely improve their ability and performance in solving Reasoning, English and quantitative aptitude to the required level of SSC, Railway Exams (RRB/ RRC), Bank Exams (SBI, IBPS or others), Teachers Exams (DSSSB/ KVS/NVS or Others). A Cut off Marks / Merit List will be prepared to call short Listed candidates (based on the performance in written examination only) for personal interview. The interview will be conducted by the AIC Panel/Officers. The Finally Selected Candidates based on the performance in interview and written exam will be called for document verification of the candidates. Candidates who fall within the number of vacancies in the merit list shall be considered for appointment. In the document verification stage, original document of candidates will be checked out. Click here to download Detailed Syllabus of Examination of AIC AO 2015.